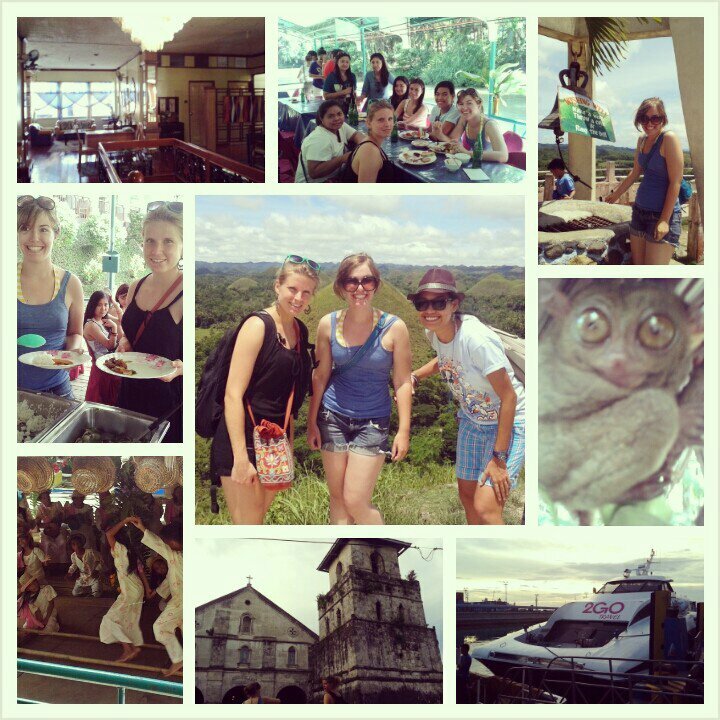 And more Bohol of course with chocolate hills, Tarsiers, Loboc river cruise and buffet lunch! 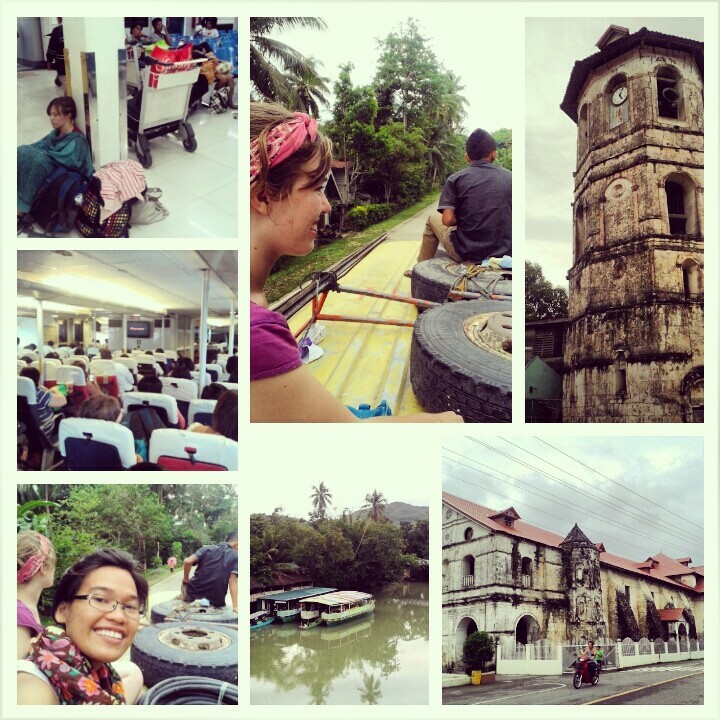 We stayed at Nisa Traveler’s Hotel in Tagbilaran (P600 for a twin fan room) and took public transport (jeep, bus, van, habal-habal, hitchhiked even!) to go around. 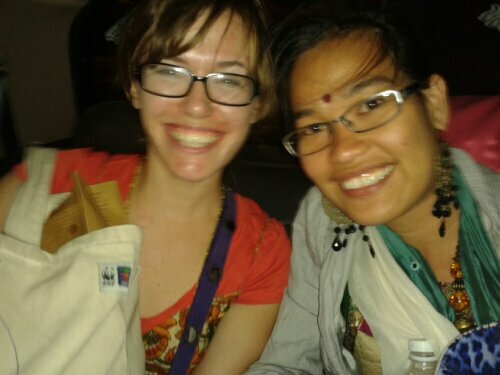 We also traveled together with Simone, a Danish volunteer rebuilding homes in Cagayan de Oro, who then stayed with me for two days in Manila! 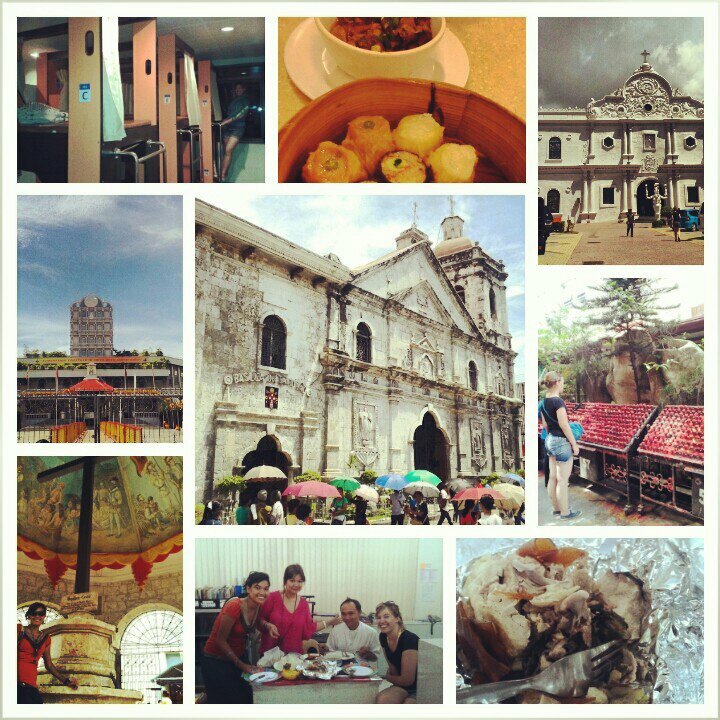 We then moved to Cebu for some religious and historical sightseeing and food tripping. We also met (and were fed by) Mamu Rose, my VSO co-volunteer from India, and reminisced our time in the land of curries, palaces and sarees! We stayed at Sugbutel Hotel, very near the Pier, dorm type AC accommodation at P250 each. 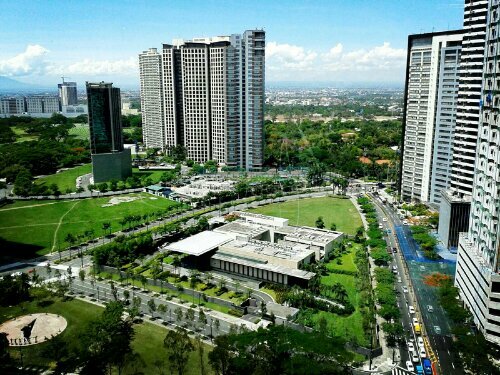 L-R from Top: Accommodation at Sugbutel; dinner of dimsum and beef brisket at Mandarin in SM Cebu; the Cebu Metropolitan Cathedral; the Plaza where they hold the Ston. Nino Festival mass; the Basilica del Sto. Nino Cebu; the red candles offertory; mandatory photo at Magellan’s Cross; lunch with Mamu Rose and her bestfriend Sir Ronnie (?! ); lechon de Cebu! After tasting Cebu lechon twice and indulging in kamias shake (bilimbi fruit), we headed to the most popular island destination in Visayas and the Philippines, Boracay! What else to do in Boracay other than soak in the clear turquoise waters, sunbathe by the creamy white sand, and party till you drop?! So we did!!! 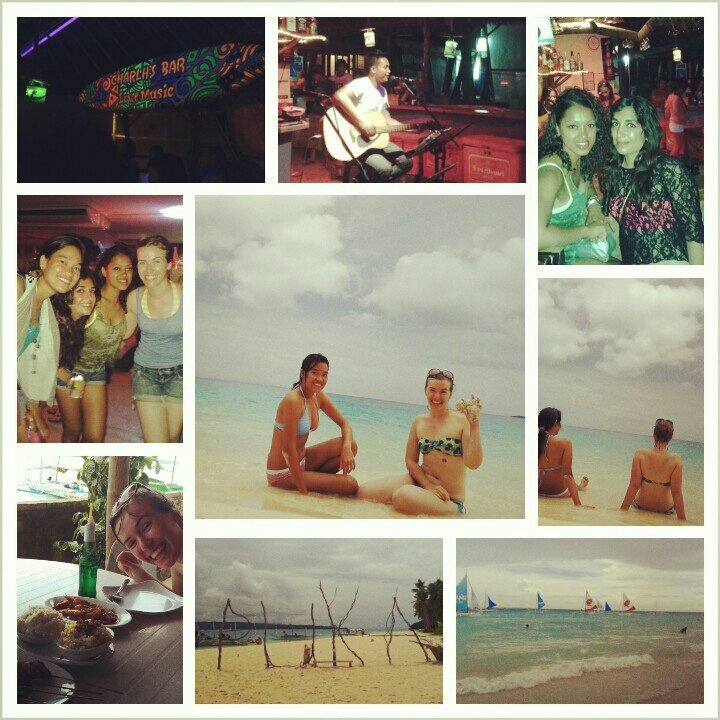 The only downside of this trip was the cancellation of our Kalibo flight via Cebu Pacific. The storm was raging on the night we we’re supposed to fly and the plane which left storm-battered Manila can’t land in Kalibo. Thus, thanks to the not very customer friendly service of Cebu Pacific and uselessness of Travel Insurance via Malayan Insurance, we spent the night along with other stranded passengers at Kalibo Airport. L-R from Top: shared trike ride from White Beach Station 3 to Pier (P20/pax only! ); the balancing boatman for the 20minute ride (very expensive terminal fee of P100! ); organic black rice porridge and champorado dinner at Kalibo airport; stranded passenger too tired and fast asleep; flight to Cebu; finally getting out of Kalibo without knowing there’s further delay in Cebu; making it to the airport (see how big her grin of relief was! 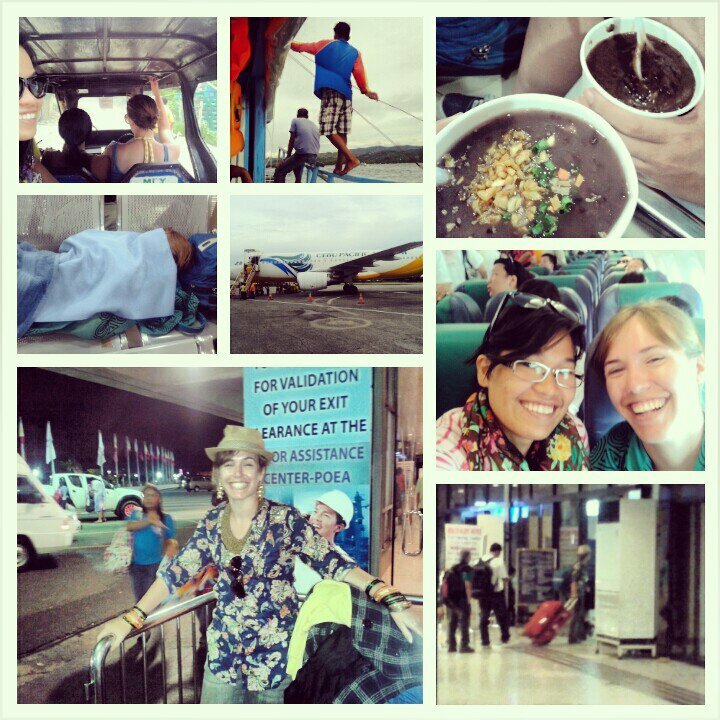 ); and finally, checking in at NAIA Terminal 1 and leaving the Philippines! In the end, we really had to rush upon arriving in Manila (after being rerouted in Cebu where there was another delay and a threat of paying terminal fee of P200) and almost literally arrive and leave at my home in Novaliches where Leah’s luggage were. We were lucky that it was the Philippine Independence Day, a national holiday and EDSA was really quite cleared. Imagine, it only took 45 minutes from my house to NAIA Terminal 1. And the lady at the back was packing and unpacking her luggage and even changed her clothes in between! Whew! PS. I miss you Ma’am ji! I know you are reading this. I’ll see you in Korea *fingers crossed* or see you here for another Instagram travel in the Philippines!